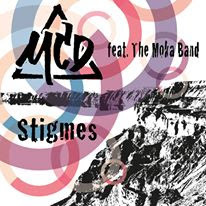 New MCD's single " Stigmes " , featuring MOKA BAND is now out! Digital single out on i-Tunes and all major digital stores. The new single from MCD featuring The Moka Band​, is full of reggae, dub influences and hip hop elements. This is from the forthcoming album 'Caldera' , coming early 2017.
'' Stigmes '' contains sample of '' Krata Ligo Agapi '' by Vevilos.